Cloud top temperatures provide scientists with an understanding of the power of a tropical cyclone. 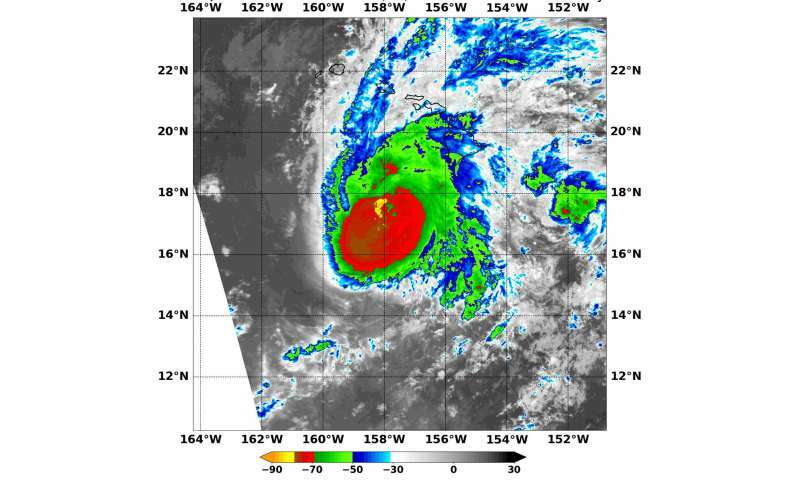 NASA's Aqua satellite observed Hurricane Lane in infrared light to those temperatures. The higher the cloud tops, the colder and the stronger they are. So infrared light as that gathered by the MODIS instrument can identify the strongest sides of a tropical cyclone. Wherever cloud top temperatures are as cold as or colder than minus 63 degrees Fahrenheit (minus 53 degrees Celsius), those storms have the potential to drop heavy rain. Hurricane Lane's cloud top temperatures were colder than that, meaning that the storm has a potential to drop even heavier rainfall. Rainfall is the biggest threat from Lane. On Aug. 23 at 7:35 p.m. EDT (2335 UTC) the Moderate Resolution Imaging Spectroradiometer or MODIS instrument aboard NASA's Aqua satellite found the coldest temperatures of the strongest thunderstorms in Hurricane Lane were as cold as or colder than minus 80 degrees Fahrenheit (minus 62.2 Celsius) north of the center. They were embedded in a large area of storms that circled the eye where cloud top temperatures were as cold as or colder than minus 70 degrees Fahrenheit (minus 56.6 degrees Celsius). On Aug. 24, NOAA's Central Pacific Hurricane Center or CPHC noted that catastrophic flooding occurring on the big island of Hawaii. CPHC said "Rain bands will continue to overspread the Hawaiian Islands well ahead of Lane. Excessive rainfall associated with this slow moving hurricane will continue to impact the Hawaiian Islands into the weekend, leading to catastrophic and life-threatening flash flooding and landslides. Lane is expected to produce total rain accumulations of 10 to 20 inches, with localized amounts up to 40 inches possible over portions of the Hawaiian Islands. Over 30 inches of rain has already fallen at a couple locations on the windward side of the Big Island." The slow movement of Lane also greatly increases the threat for prolonged heavy rainfall and extreme rainfall totals. This is expected to lead to major, life-threatening flash flooding and landslides over all Hawaiian Islands. A Hurricane Warning is in effect for Oahu, Maui County...including the islands of Maui, Lanai, Molokai and Kahoolawe. A Tropical Storm Warning is in effect for Hawaii County. A Hurricane Watch is in effect for Kauai County...including the islands of Kauai and Niihau. Lane will pass dangerously close to the main Hawaiian Islands as a hurricane on Friday, and is expected to bring damaging winds. The slow movement of Lane also greatly increases the threat for prolonged heavy rainfall and extreme rainfall totals. Large and damaging surf can be expected along exposed shorelines, especially along south and west facing coasts, with localized storm surge exacerbating the impacts of a prolonged period of damaging surf. Although the official forecast does not explicitly indicate Lane's center making landfall over any of the islands, this remains a very real possibility. Even if the center of Lane remains offshore, severe impacts could still be realized as they extend well away from the center. CPHC said, "Hurricane Lane is beginning to show some signs of slow weakening due to wind shear of over 20 knots from the southwest according to the SHIPS and UW-CIMSS analyses. There is no eye evident in satellite imagery, which is likely a result of these hostile conditions." At 11 a.m. EDT (5 a.m. HST/1500 UTC), the center of Hurricane Lane was located near latitude 18.7 degrees north and longitude 158.0 degrees west. Lane is moving toward the north near 5 mph (7 kph), and this general motion is expected to continue through tonight. A turn toward the west is anticipated on Saturday, with an increase in forward speed. On the latest forecast track, the center of Lane will move dangerously close to portions of the central Hawaiian Islands later today, Aug. 24 and tonight. Maximum sustained winds are near 110 mph (175 kph) with higher gusts. Lane is now Category 2 hurricane on the Saffir-Simpson Hurricane Wind Scale. Some additional weakening is forecast later today and tonight, but Lane is expected to remain a dangerous hurricane as it approaches the islands. Further weakening is expected on Saturday, Aug.25. The estimated minimum central pressure is 962 millibars.